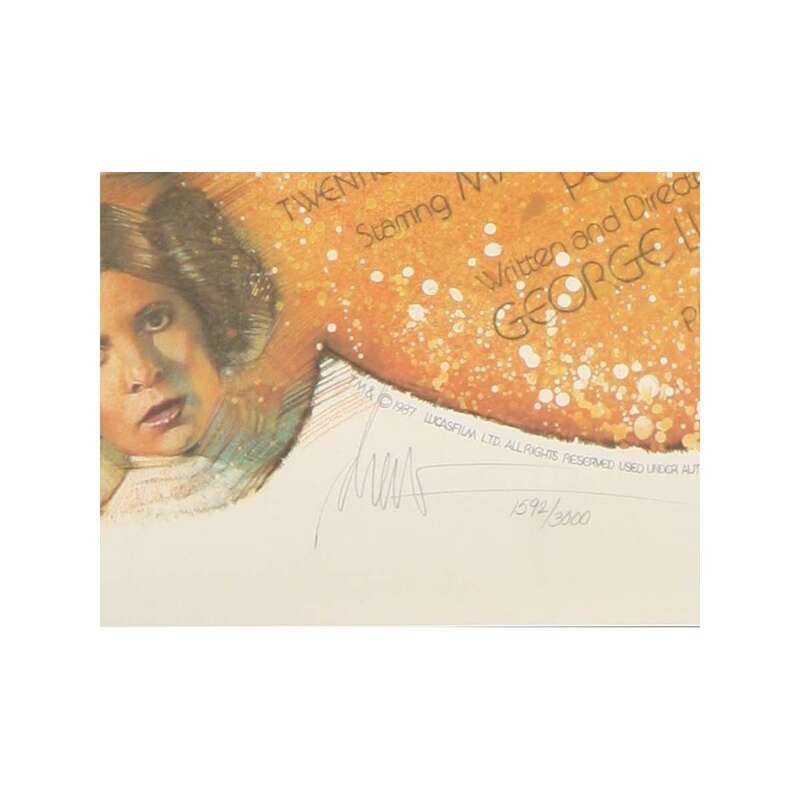 > Archives>STAR WARS THE FIRST TEN YEARS Kilian signed & numbered Poster 1sh '87 by Drew Struzan! 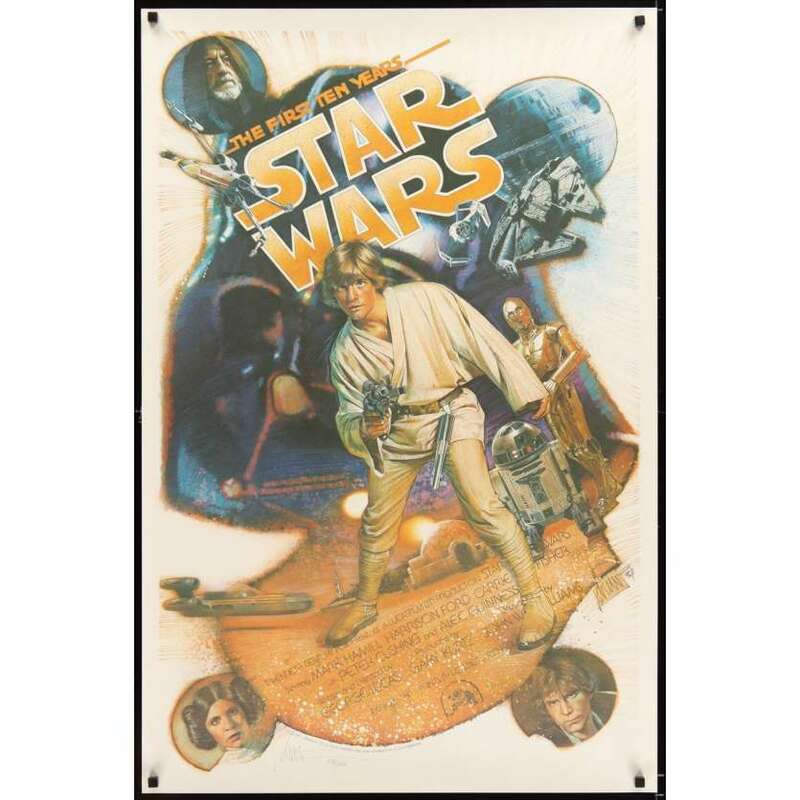 STAR WARS THE FIRST TEN YEARS Kilian signed & numbered Poster 1sh '87 by Drew Struzan! Star Wars Episode IV: A New Hope, originally released as Star Wars, is a 1977 American epic space opera film, written and directed by George Lucas. It is the first of six films released in the Star Wars saga: two subsequent films complete the original trilogy, while a prequel trilogy completes the six-film saga. It is the 4th film in terms of the series' internal chronology. It stars Mark Hamill as Luke Skywalker, Harrison Ford as Han Solo, Carrie Fisher as Princess Leia and the great Alec Guinness as Obi-Wan "Ben" Kenobi. Important Added Info: Note that this poster has been personally autographed (signed) AND numbered by poster artist Drew Struzan (it reads "Drew 1496/3000" at bottom left). Also note that this poster was created by Kilian Enterprises. Kilian Enterprises posters are special posters NOT intended for theater use. They were sold directly to fans. They have far better printing than regular theater posters, and have better images. Also note that this poster is printed on a much heavier than normal paper stock (we don't know why, but it is nice!). Finally, note that this poster was never folded! An unfolded poster is almost always far more difficult to find than a folded poster of the same title, and finding unfolded posters in excellent condition is even more difficult! Overall Condition: Near Mint ! (C9).